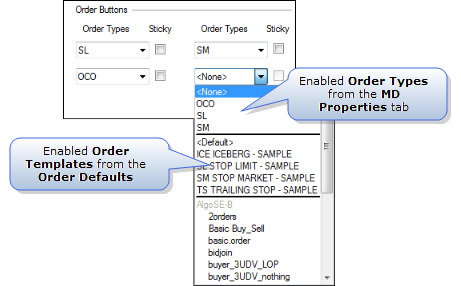 You can use order templates via MD Trader by assigning an order template to a MD Trader order button. You may select any template enabled in the Order Defaults window. If you select a template that is not applicable for the product or market, the order button will appear in MD Trader but will not function. Once the template is assigned to an order button, you can click the button and then the Bid or Ask column to place the order. You may also submit orders using the Order Type drop-down list. Right--click MD Trader to access the context menu and select Properties . In the Order Button section, click to select the desired order template from the drop-down. Repeat Step 2 for each order button you want to configure. Click the desired order button. The selected button turns yellow and the Order Type drop-down list resets to blank (no value). Yellow indicates the currently selected order parameters. Click the Bid or Ask column to place the order. If the Order button is sticky, the Order Type field remains blank. If the Order button is not sticky, the Order Type field resets to the order template assigned to the selected customer. Click the Order Type drop-down list and select the desired order template. The Order Typedrop-down list displays with a yellow background. The selected order template name remains in the Order Type field.